Water accumulates in a street on the west side of McAllen. 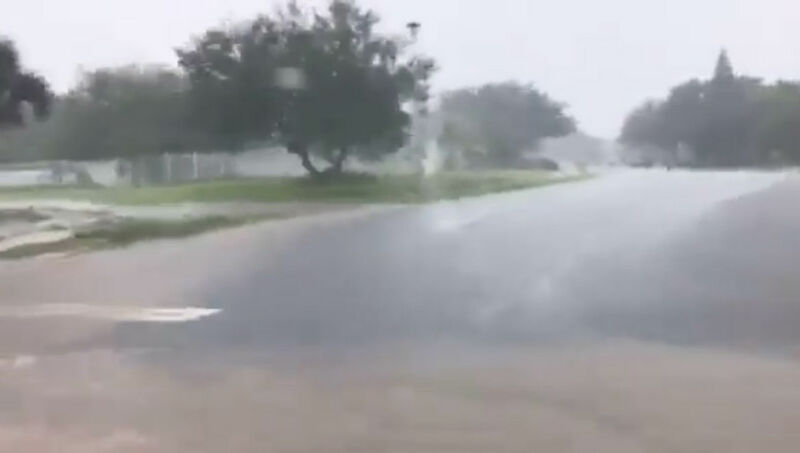 McALLEN — Some afternoon street flooding was reported Tuesday as a cool front moving through the Valley triggered rainfall of over 4 inches in some areas. The daily record rainfall at McAllen Miller International Airport of 0.62 inches was shattered, according to a Tweet from the National Weather Service in Brownsville. At 4 p.m., 4.45 inches of rain had been recorded at the airport. Many of the street closings in McAllen were near the airport and in South McAllen. Among the areas cited by the city as “major flooding” were 10th Street and Wichita Avenue, Second Street and Wichita Avenue, Second Street and Pecan Boulevard, Nolana Avenue between 23rd and 29th Streets, Jackson Street between Second and 10th Street and 12th Street and Quamasia. Highs Wednesday behind the cool front will be much cooler than the recent trend, topping out in the upper 70s. A chance for rain remains in the forecast Wednesday, but will vanish Thursday with highs back up to the upper 80s, according to the weather service.